Shown with optional GoPro Adapter plate and GoPro Camera for reference. What included? 1x Ball Head Painter's Pole adapter and hardware, plus hex wrench. What's not included? The GoPro camera shown, the GoPro Adapter (However it is available on the ClickSnap web site) for more info on Painters poles please check out the Clicksnap website. We recommend the Mr. LongArm, Wooster Sherlock, JIffyloc or Earth Friendly poles. This is the ultimate combination, the universal Painter's Pole Adapter mated with a light weight ball head. 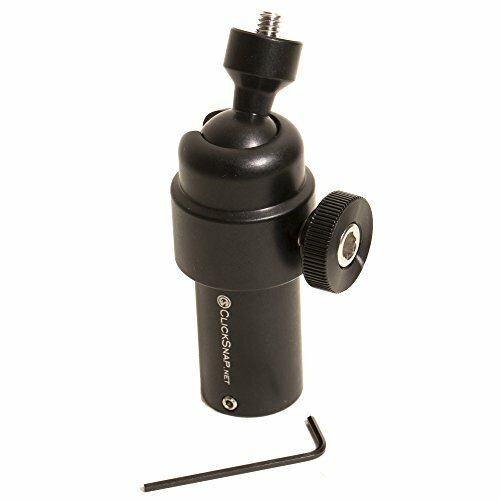 This rig mounts to any standard painter's pole and provides an industry standard 1/4-20 tripod thread for mounting your camera, video camera or goPro camera. The ball head allows a full 360 degrees of rotation and a full 180 degrees of tilt. This adds up to the ultimate setup for using your camera or video rig on a pole. Get the perfect angle.... Get the shot. If you have any questions about this product by ClickSnap, contact us by completing and submitting the form below. If you are looking for a specif part number, please include it with your message.